Tara Pham is CEO and co-founder of CTY, a civic tech company that has been awarded a grant from the John S. and James L. Knight Foundation’s Prototype Fund, which supports early-stage information projects. CTY’s product, Numina, encourages walking and biking through its plug-and-play devices that deliver real-time bicyclist and pedestrian counts and intuitive data visualizations. The City of St. Louis Department of Health will benefit from CTY’s innovation. Scroll to “Numina” in the list of grant winners here. 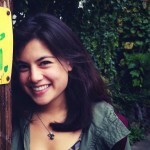 Learn more about Tara Pham in her Chapter member profile. Explore the USGBC-Missouri Gateway Chapter online directory to learn more about our members. USGBC-Missouri Gateway Chapter will celebrate our 15-Year Anniversary in 2016. We seeking consulting services to help us develop a campaign to celebrate! See our Request for Qualifications. Qualifications are due to USGBC-Missouri Gateway Chapter by 5 pm on June 22, 2015. We’ve all been there. It’s that moment – perhaps it’s after work, during work, could be any time really- when you need to EAT. It can sneak up on you. You’re being a perfectly nice and happy person and then you’re “Hangry.” That’s “Angry” plus “hungry,” folks, a bad combo in my opinion. Particularly nasty when it’s early on in the summer and your home grown tomatoes have yet to flourish and you ate all of those beautiful radishes you planted in early spring. And the morels you hunted and gathered? All eaten. “Why did I bother sharing those?” you’re thinking. You’re basically dying and you need a SNACK. BUT WAIT! You’ve got options. The Green Dining Alliance has been certifying restaurants in St. Louis to ensure you can dine out without compromising the environment or your stomach. The Green Dining Alliance (GDA), an initiative of St. Louis Earth Day, is a restaurant sustainability certification program that works with restaurants to reduce their environmental impact by completing an on-site audit that evaluates all areas of operations. St. Louis has a lot of these restaurants! In fact, Maplewood’s Special Business District has been named the nation’s 1st Green Dining District. 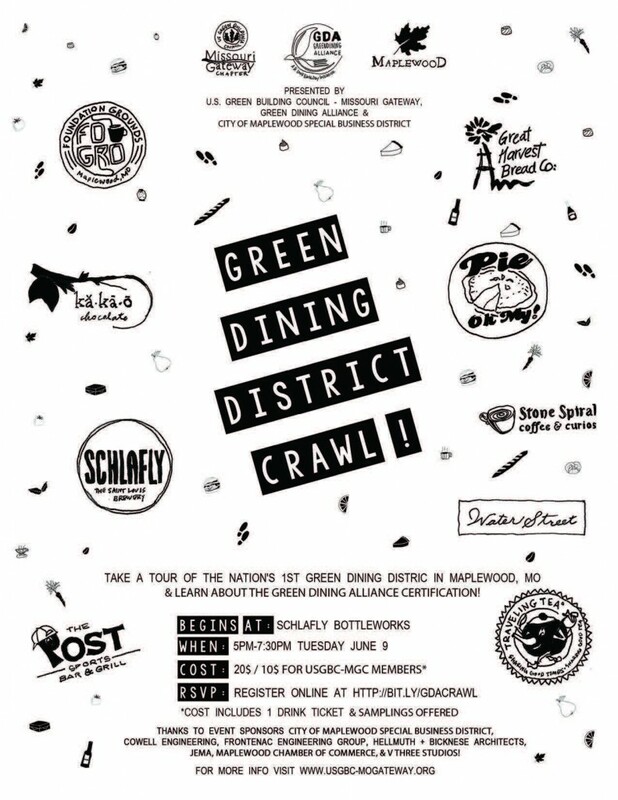 On Tuesday, June 9th from 5-7:30pm, the U.S. Green Building Council – Missouri Gateway Chapter, the Green Dining Alliance and Maplewood Special Business District are partnering to offer a Green Dining District Crawl. Check out Maplewood’s green dining district while having a drink and samples provided by participating GDA restaurants. The evening will begin at with a brief presentation about GDA certification at Schlafly Bottleworks. Attendees will enjoy a free drink from Schlafly and then crawl to restaurants within the district. The event is open to the public and $20, $10 for USGBC-MO Gateway members. Learn more and register for the Crawl today! The USGBC- Missouri Gateway Chapter is providing an opportunity for local government green teams to share best practices and learn from one another! Plan to join us for the Local Government Green Team Meet Up on June 20 at the Green Homes Festival. This year the Festival has a NEW location- the Butterfly House and Faust Park! Networking & Adjourn to Festival – Open until 4 pm! Attendance to the Green Homes Festival is also free. Have an experience you’d like to share with the group? Include it in the “any special topic you’d like to address?” box when you RSVP! 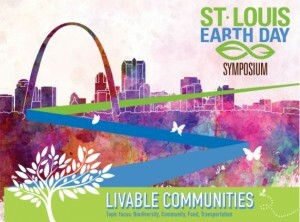 Attendees at the 2015 St. Louis Earth Day Symposium will learn about sustainability practices that are changing the face of our cities and neighborhoods, while creating a positive environmental, social, and political impact in our communities. Topics include transportation, food, biodiversity and community. Through an interdisciplinary approach and networking opportunities, attendees will connect and engage with others, understand their work in a greater context and learn from peers and regional experts. Scholarships and discounts available to ensure access for all those interested. Learn more and register on the St. Louis Earth Day Website.